THE NORTHERN IRELAND FRIENDS OF ISRAEL AUCTION HAS NOW CLOSED. We have raised over £1,000 for really worthwhile cross community football charities in Israel and Northern Ireland. All proceeds go to NIFI’s chosen charities– SOCCER FOR PEACE (partnered by Maccabi Tel Aviv) and INTEGRATED SCHOOLS FOOTBALL in NI. It’s easy to bid – this is how! 1. HOW TO BID: email nifriendsofisrael@ymail.com now. Your bid must be at least £5 more than the existing highest bid shown above for the relevant lot. 3. The final date for making bids is 12pm on Friday 4 December 2009. 1. Your email to us containing your bid constitutes a binding agreement by you to purchase the item at the price stated in your bid if called upon to do so by the organisers . 2. The organisers are not obliged to advise you if your bid has been accepted, rejected or exceeded. They will however from time to time put details of the then current highest bids on this website – so please check regularly. 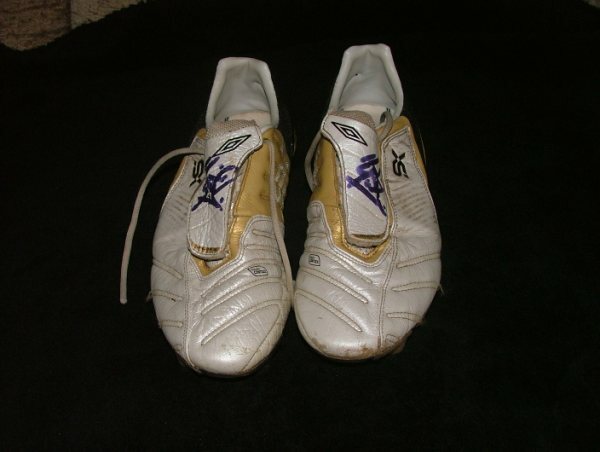 The initials relating to the then highest bidder will appear beside the amount of the relevant bid for each lot. 3. All items (except where stated) are signed by players in the squads of the clubs but we cannot guarantee particular players have signed. In those cases were clubs have provided certificates of authenticity these will be provided. 5. If we have not received cleared funds from you for the amount of your bid within 14 days of us sending you a message by email that your bid has been successful, the organisers may re-auction the item or offer it to another bidder without giving notice to you. 6. In the event of dispute the decision of the organisers is final. The organisers may refuse to accept a bid at their absolute discretion if they do not consider it a serious bid or it is less than the reserve price. 7. The organisers are NIFI co chairmen Terry McCorran and Steven Jaffe and they can be contacted at nifriendsofisrael@ymail.com.